Fuzzy has a great new plan as the Adventure Director of the Class Pets Club -- the pets are going to join the Halloween Parade with their kids! In disguises, of course. Finally, they won't be missing all the fun! But then spooky things start happening, and not in a fun, Halloween way. Is Leo Gumpus Elementary... haunted? And if so, what's an adventurous guinea pig going to do about it? 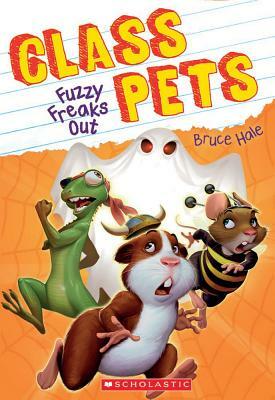 Bruce Hale is the Edgar-nominated author and/or illustrator of more than 40 seriously funny books for children, including Big Bad Detective Agency and the Chet Gecko, School for S.P.I.E.S., and Clark the Shark series. He lives in Southern California, where he is also an actor, Latin jazz musician, and award-winning storyteller. You can find him online at brucehale.com.